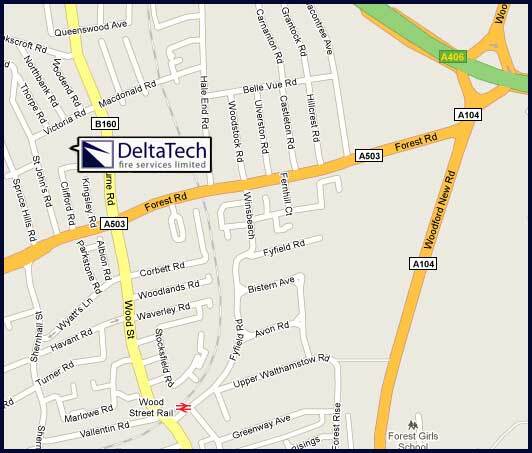 Delta Tech Fire Services are located in East London, just 5 minutes from Woodford Green underground station on the Central Line and Charlie Brown's Roundabout on the North Circular Road (A406). Our office in 18 Spring Gardens, Woodford Green, Essex, IG8 7DD will remain open. We ask though that all customers and suppliers send all correspondence to Unit 17 Walthamstow Business Centre, Clifford Road, London, E17 4SX. If you need to find us, please make use of the maps below, or alternatively click here to find us through Google Maps.